Prokaryotes include the domains Bacteria and Archaea. All of the organisms that we study in this lab will be in the domain Bacteria. 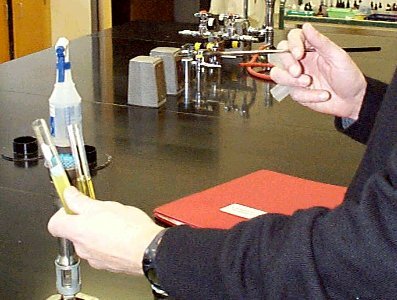 This exercise is designed to familiarize students with some basic equipment and techniques used in the study of microorganisms. In addition, students will learn some basic techniques used in identifying prokaryotes and make and view microscope slides of some common prokaryotes. It is important that all instruments and media discussed below be sterile, that is, free of any living organisms. The use of sterile equipment, media, and techniques prevents unwanted microorganisms from contaminating your cultures. Culture media containing the necessary nutrients are used to grow microorganisms in a laboratory. Four kinds of commonly-used culture media are shown below. Broth is a liquid that contains nutrients for bacteria to grow. It is kept in glass tubes and capped with a metal or plastic sleeve. Agar is solid or semisolid. It liquefies at 100º C and solidifies at 40º C.
Agar plates are Petri dishes that contain agar for growing microorganisms. They have a large surface area and are useful for isolating and studying microorganisms. After they are inoculated, they are incubated in an inverted position. This prevents condensation from dripping from the cover onto the agar. Agar slants are useful for maintaining cultures. Microorganisms grow on the surface of agar plates and slants. Subculturing refers to transferring microorganisms from one medium to another. For example, bacteria growing in broth may be transferred to an agar plate. Wire loops are used to transfer microorganisms from liquid media to liquid or solid media. 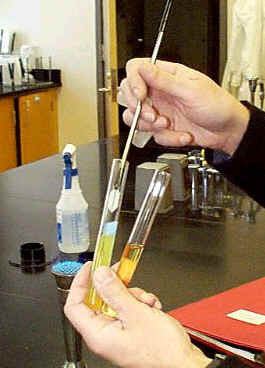 Pipettes are used to transfer liquids. A mechanical device must be used with pipettes to create a vacuum. Bacterial cells on the agar or in the broth will reproduce rapidly if other environmental conditions such as temperature are favorable. A single cell on the agar will shortly produce a colony of cells that is easily visible to the naked eye. Such a colony is a pure culture because it is a single species. An incubator is a chamber that maintains a constant temperature. After microorganisms are transferred to broth or agar, they are placed in an incubator (incubated) for a period of time while the cells reproduce. Refrigerators are useful for maintaining stock cultures for long periods of time because microorganisms grow (reproduce) very slowly at low temperatures. They can also be used to store subcultures after they have been incubated. The procedure discussed below can be used to transfer microorganisms from a tube of broth to another culture tube. Microorganisms are often transferred from one medium to another with a wire loop. 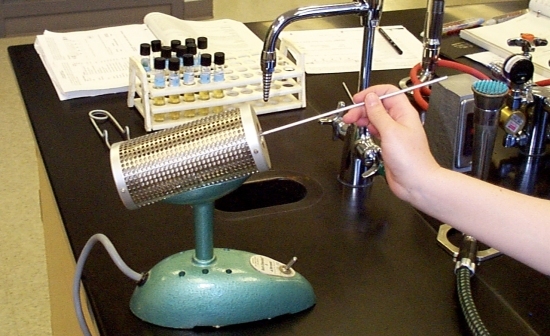 Before the loop is used to remove a sample of microorganisms, it must first be sterilized. 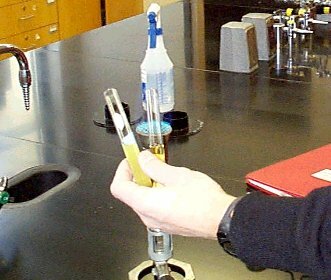 A bacti-cinerator or bunsen burner can be used to heat the loop. Figure 3 shows a bacti-cinerator. 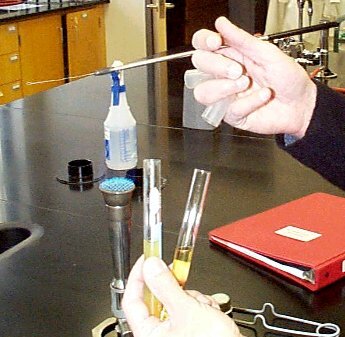 Figure 4 shows a bunsen burner being used to sterilize the loop. The wire should be heated in a bacti-cinerator or a bunsen burner flame until it glows red. The loop should be cooled in the air for 10 to 20 sec. Care should be taken not to put it down in order to avoid contamination. Hold the source tube and also the tube to be inoculated in one hand as shown in figure 5. The loop is held in the other hand. The two tubes are uncapped by using the hand that holds the loop. The likelihood of contamination can be minimized by keeping the caps in your hand as shown below. Pass the mouths of the tubes through the flame. Skip this step if you are using a bacti-cinerator. Remove a sample from a broth culture by using a sterile wire loop. Touch the colony to be subcultured with the wire but do not break the surface of the agar. Reflame the mouths of the tubes and replace the caps. Sterilize the loop in the flame or the bacti-cinerator before putting it down. Transferring to broth—Put the loop in the broth and then swirl it. Agar slant or plate—When inoculating an agar slant or plate, draw the loop very lightly over the surface while being careful not to break the surface. A straight or a zig-zag motion can be used. Transfer S. marcescens: from broth to a sterile agar slant using a wire loop. Transfer S. marcescens: from broth to a sterile broth using a wire loop. Transfer S. marcescens: from a slant to a sterile slant. Transfer S.marcescens: from a broth to an agar plate. Put your name on each tube or plate and place them in a 37 degree incubator for 48 hours. The procedure below will demonstrate that bacteria are commonly found throughout our environment. Use a cotton swab to sample bacteria on a surface such as a desktop, the floor, or a stair handrail. After rubbing the swab on the surface, rub it lightly on the surface of an agar plate. Your instructor will place the plates in an incubator for 48 hours. They can be examined during the next lab period. Procaryotes are typically stained to make them easier for viewing. We will use a basic staining procedure called gram staining. This staining method separates bacteria into two groups based on the thickness of their cell wall. 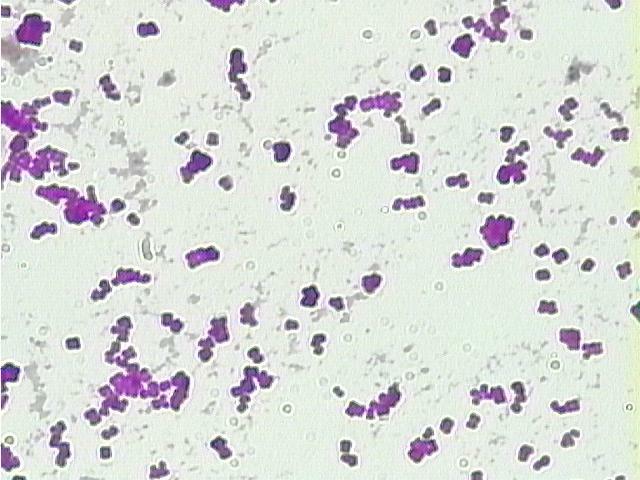 Gram positive bacteria have a thick cell wall and will appear dark purple after a gram stain. Gram negative bacteria have a thinner cell wall and will appear lighter in color. 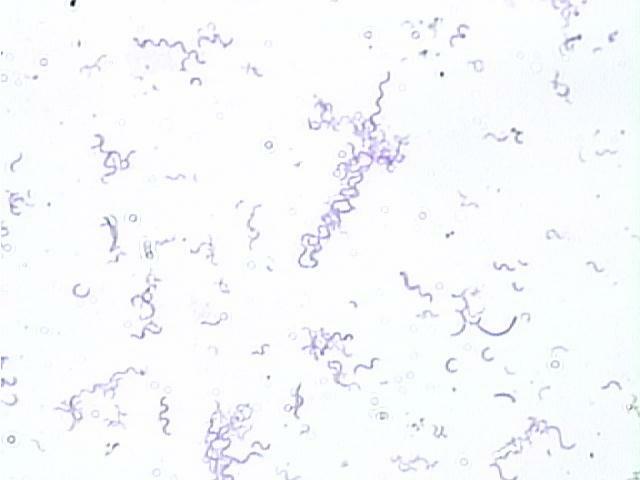 The gram staining technique involves making a smear of bacteria on a slide and then adding the stain. Use a wire loop to take a sample Staphlococcus epidermidis from a slant and place it on the center of a slide. Take a sample of Escherichia coli from a slant and place it on the center of a second slide. Use a wire loop to add a very small amount of distilled water to the sample and use a wire loop to spread the culture evenly over an area the size of a dime or smaller. Be careful not to use too much water so that it will not take too long to dry. Allow the slides to air-dry. If you used too much water, it can be spread over the surface of the slide so that it dries faster. After the slides are air dried, the bacteria must be fixed (attached) to the surface of the slides so that they do not wash off during the staining process. The bacteria can be fixed by holding the slide above the opening of the bacti-cinerator for about 30 seconds. 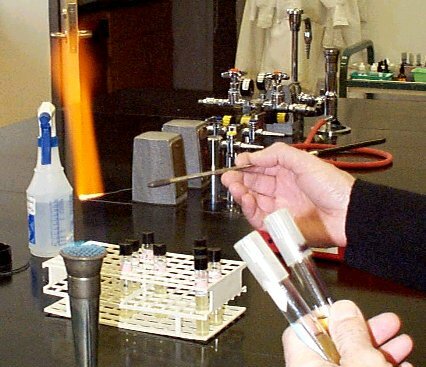 If a bunsen burner is used, pass the slide over the flame two or three times. A continuous, nonstop motion should be used as the slide passes over the flame. Each pass should take approximately 1 second. Place a wire test tube rack in a plastic tray and place the slides on the test tube rack as shown in figure 10. Flood the slides with crystal violet for 1 minute. 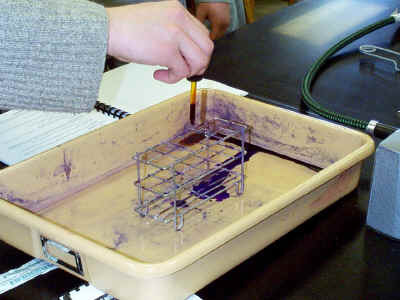 This should be done over the sink or a tray to prevent stain from spilling on the laboratory bench top. Wash the slides with tap water. Flood the slides with Gram’s iodine (a mordant) for 1 minute. Wash again with tap water. Flood the slides with 95% ethyl alcohol. This decolorizes bacteria that have thin cell walls. Counterstain with safranin for 45 seconds. Blot dry. The slide is ready for viewing; cover slips are not necessary. View the slide using high power. You may wish to also view the slide using the oil immersion lens. Draw and describe each slide. Note the gram positive cocci (Staphlococcus epidermidis) and the gram negative bacilli (Escherichia coli). Observe and draw a prepared slide of typical spirilla. After you are finished with the slides, clean the immersion oil from the microscope lens. Figure 12. Bacilli X 1000. Cyanobacteria (sometimes called blue-green algae) are gram-negative bacteria that can photosynthesize and some can fix atmospheric nitrogen. The only organisms capable of fixing nitrogen are bacteria, and this is primarily done by the cyanobacteria. The fixation of nitrogen by cyanobacteria may have allowed plants to invade the land during the Paleozoic. 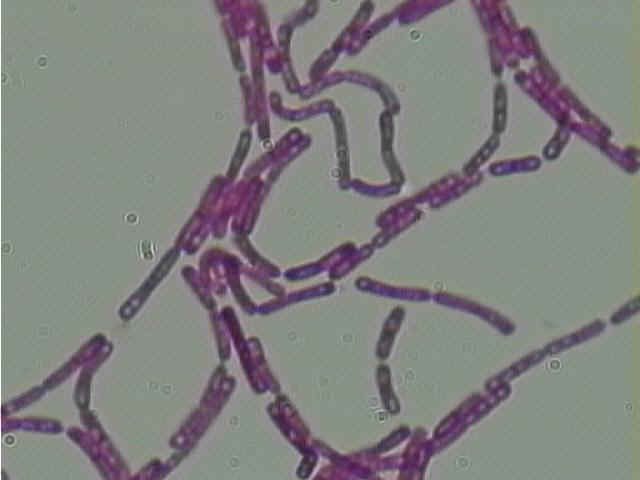 Unicellular, filamentous, and colonial species of cyanobacteria are common.Gloeocapsa is a unicellular cyanobacteria. The gelatinous material surrounding each cell causes the cells to stick together. Some Cyanobacteria form symbiotic associations with fungi forming structures called lichens. Observe and draw live Oscillatoria and Anabaena. If live organisms are not available, use prepared slides. Live organisms can be viewed by placing a small amount of the organism on a slide in a drop of water and then covering it with a cover slip. Be sure to indicate the magnification used in your drawing.